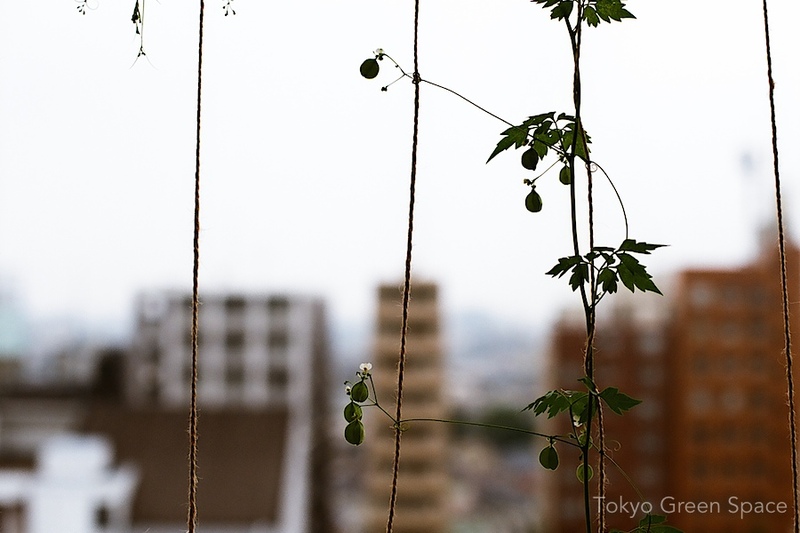 Another fast and cheap climbing vine is called “balloon vine” (fusenkazura) in Japanese. I love how it spreads out, attaches to the rope, and offers white flowers and odd sacks. This sunflower is blooming in a tiny mound of dirt outside a neighbor’s house. I love how she maintains this corner and always offers some seasonal color to the passers-by. In the foreground, there’s an automated surface parking lot on a lot that may get developed. The tall white structure is an elevated parking lot that is semi-permanent, and it appears to have been erected on the property of a fairly large temple and graveyard. On either side, offices and apartment buildings frame a dense and changing city. I like this before and after photo set. It shows an apartment building green space that sits between the ten story building and its two story neighbors, homes and a plumbing supply business. It borders a small street that is mostly pedestrian. The garden has a mix of flowering vines, bushes, bulbs, and a row of pine trees that were probably planted 35 or 40 years ago. The utility pole support is borrowed infrastructure for training a vine upwards. The photo above was taken October 24, 2011, and the one below November 23, 2011. Above you can see all the fullness of summer: lush foliage, pink and red flowers at every height level, a blurring of the boundary with the neighbor’s garden. A month later, the 3 story tree has been heavily pruned, which lets light in during the cold months. All the plants have been cut back, and you can see the wall separating the properties. The maintenance is a mix of semi-professional gardeners hired by the apartment building and a retired couple living in the garden apartment. Although far more restrained in winter, the garden continues to bloom in every month, no doubt because of their efforts. Recently I was helping my friend Matt making bonsais in his Roka-koen apartment in Setagaya when I saw this incredible sunset. This is his view looking west from his fifth floor apartment. It’s amazing how dense Tokyo is, and how far the city spreads out from the center. A small Shinto shrine is the reason that these two giant trees are still there. Dating back perhaps to just after the war, these trees seem to be an important stepping stone for neighborhood and regional birds. With the clear winter skies and the leaves gone, you can see Mount Fuji through the trees. Why aren’t mature trees recognized as a vital urban resource? How can these small islands of nature be connected with larger parks and other micro-green spaces? What is the role of Shinto as a religion and as thousands of property owners in supporting urban wildlife? Marui’s new Nakano store offers a generous sidewalk, blurring public and commercial spaces. I love how Marui is making public landscaping its brand identity. I am super pleased that the new Marui department store in Nakano is building a great entrance. Rather than build up to the edge of the property, Marui has a two-story atrium by setting back its entrance, with four mature trees and hopefully some planter beds. By blurring the line between public and commercial space, Marui will create an engaging sidewalk with plants. For a short stretch of this narrow sidewalk on the south side of the JR station, there will be plants on both sides. This store design seems related to the new Shinjuku store landscape, which I blogged last year. That store also has two very popular ground floor food shops (an Italian gelato and French bakery) that are very open to the sidewalk and attractive, new green spaces. I like to see how smart retailers realize that improving the sidewalk and pedestrian experience will increase business and goodwill. There is no contradiction between generosity and profits. I hope that this public green space becomes a recognizable part of Marui’s brand identity. I’ll definitely check out Marui Nakano when it opens soon. Why is the entrance to Roppongi Hills so ugly and uninviting? Every time I walk from the subway into Roppongi Hills I am shocked at the extremely ugly first view of this mega-complex. In addition to the elevated freeway, pedestrians are greeted by this horrendous, wide, astroturf-covered dead space in front of Roppongi Hills North Tower. How could this make people want to enter Banana Republic? And what does this say about Mori Building’s vision for integrating their properties into their neighborhoods and communities? I feel that this forgotten and dirty space implies that the real landscape only begins at the podium level and that the North Tower is not of equal status to the rest of the complex, despite being in the front. It’s as if they imagine that their important customers enter the complex only by car. This lack of respect for pedestrians, neighbors, and context is completely unnecessary. The smallest gesture would improve this space and make it more inviting and alive. If Mori Building reads this post, I hope they will consider improving this entryway to their otherwise well landscaped property. If anything, improving the entrance might also provide an opportunity to consider how to extend their landscape ideas further out into the neighborhood, creating connections with other shops and residents, and building a larger and healthier eco-system that would benefit Mori and their neighborhood. Last night I attended the last Pecha Kucha Tokyo of the zeros decade, one block west of Roppongi Hills, and remembered that I had taken this photo weeks ago. Each time I am shocked as if for the first time. Outside of the expensive office towers and glittering malls, I wonder how such an ugly neighborhood can be attractive to multinational companies and foreign ex-pats. The incredibly prolific, creative, and productive Chris Berthelsen has launched a new public project, called ここの話, Koko no hanashi: Talking about Here. It’s an amazing, low tech and also analog project that creates community dialogue about public, publicly visible, and abandoned urban spaces. He’s prototyped it this week in western Tokyo, and you can read about it online and follow its progress through Twitter and a mailing list. Talking about Here relies on a simple framework: placing a laminated sign and a simple question, like “Why can’t we use this park at night,” to invite neighbors to discuss very local spaces that are shared, visible, or under-utilized. People can respond using the QR code, or by simply writing in the notebook that is attached to the sign with a pen. Responses will be collated on a stripped down blog specific to each location. The five initial locations are an interesting mix: a bleak park in front of a factory (run-down, official), a friendly neighborhood park which has been declared a ‘night no-go zone’ (well-kept, official), a park under an elevated freeway (run-down, secluded, official), an abandoned car in an apartment complex parking lot (illegal use), and a deserted house on a school route (run-down, private property). The prototype just went up this week, and there are many questions: Will the signs be taken down? Will officials contact Chris to question his actions? Will neighbors use the QR code or notebooks to record their feeling and memories? Will neighbors be interested to read what other neighbors record? I am always amazed at Chris’ imagination and ability to make things happen, with low fidelity tools and a bit of daring. 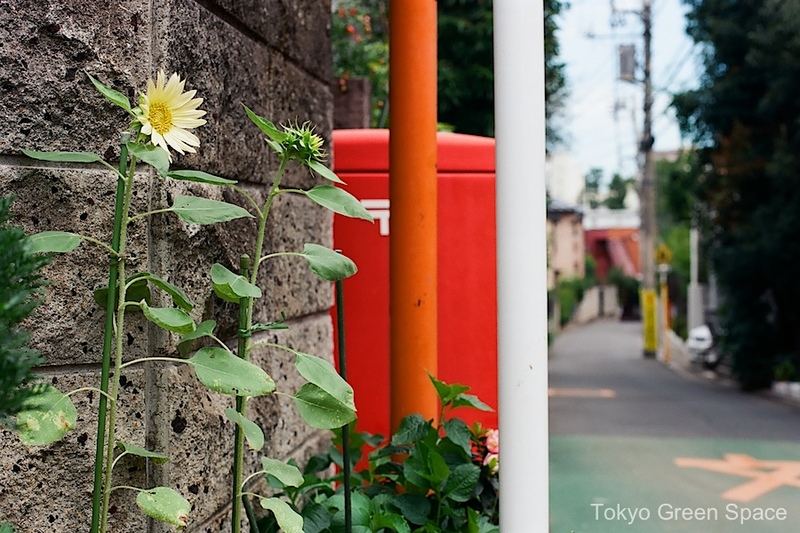 We have worked together in creating the Tokyo DIY Gardening project, including the blog and collaborative mapping workshop last August at 3331 Arts Chiyoda. I believe he’s now got four projects launched in his spare time, all of which are shared freely online. I have asked Chris if I can participate in Phase 2 of this project. I already have a few places in mind: a beautiful abandoned wood house with a garden that is minimally maintained by a neighbor, a pedestrian path that is heavily used and sitting above an old creek, my neighbors’ fruit trees. It might be interesting to ask property owners if they would like to have a sign that seeks comments about their public gardens. I wonder what the reaction will be? Azabu Juban is one of Tokyo’s most central and most expensive neighborhoods. Arriving at the Tokyo Metro station for a meeting with a book editor, I was struck by just how unattractive the roadway is. In the opposite direction are small streets with traditional Japanese food, French cafes, and many charming places. But in this direction, there is a large swath of concrete plus interconnected elevated freeways. This combination of high value real estate and astounding dead space also occurs nearby at Mori Building’s Roppongi Hills. I wonder if Japanese are particularly astute at ignoring the unaesthetic and directing their vision to the more attractive parts? How much more valuable would these neighborhoods be without the visual and air pollution caused by elevated freeways? How can a combination of private and public investment increase property and use values? While freeway removal seems like the best solution, even hiding them with plants would greatly increase the property and use values below and adjacent to these dead spaces. An example are the beautiful mature ginkos in Sendagaya, at least when they are fully leafed out. For a city that suffered tremendous human and structural damages from World War II fire bombs, it is sad how little efforts are taken to preserve older houses and farms in Tokyo. The tax code, which levies an inheritance tax on the real value of property, literally forces many families to sell or subdivide their childhood homes in order to pay the tax bill. When parents die, the wooden homes with large yards and small urban farms become quickly transformed into multi-unit condos and apartments. New construction in Tokyo is often cheap and pre-fabricated, with the idea being that buildings should last for thirty years before being raised and rebuilt. Old gardens and trees are replaced with hardscape that provides neither shade nor habitat. Above are images of a grand home and garden near Nodai, the Tokyo University of Agriculture. 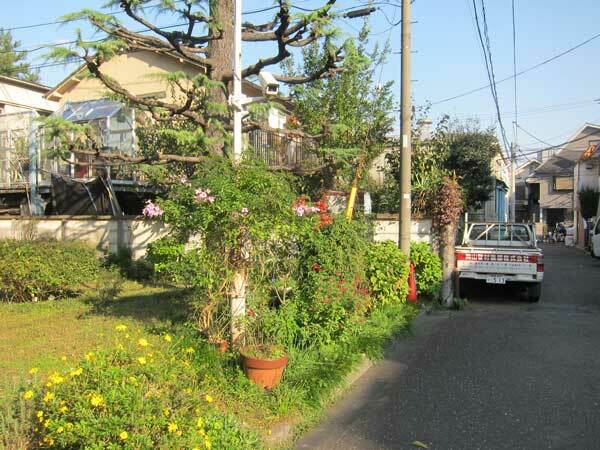 It is one of only a handful of historic homes along the 20 minute walk between the Kyodo station and Nodai. Below is an example from my neighborhood of brand new construction of a six unit building on what was previously a single family lot with garden. The amount of planting probably covers less than 2% of the lot size, and there’s four parking spaces paved in front. Changes to the tax code are necessary to stop this steady erasure of history and habitat. Click the link below to see another nearby house during demolition and its rebuilt form.